Prof Ching Tang’s research interests lie in the general areas of Chemical and Condensed Matter Physics, and in particular in organic electronics. He has been recognized for the invention of the high-efficiency Organic Light Emitting Diodes (OLED). Internationally known as “Father of OLED”, the Hong Kong born and raised Prof Tang is the first Chinese recipient of the highly reputable Wolf Prize in Chemistry (awarded in 2011). The award is for his discovery of OLED, which is starting to replace Liquid Crystal Display (LCD) in smart phones, computers, and televisions. The Wolf Prizes in physics and chemistry are often considered the most prestigious awards in those fields after the Nobel Prize. Based on this key invention, a superior flat-panel display technology has been developed for electronics display applications from cellular phones to large-area high-definition television screens. Prof Tang has also been recognized for the discovery of the organic hetero-junction diode. This discovery has been affirmed as a milestone contribution to the field of organic electronics and opto-electronics. The hetero-junction device structure has been found to be the key to obtaining high performance in organic-based, thin film devices including OLED and solar cells. Prof Tang received his PhD in Physical Chemistry from Cornell University in 1975. He then worked in Eastman Kodak and was named Distinguished Fellow of the Kodak Research Laboratories in 2003. He joined the University of Rochester as the Doris Johns Cherry Professor of Chemical Engineering in 2006, and has joint appointments in the Department of Chemistry and the Department of Physics and Astronomy. He joined HKUST Jockey Club Institute for Advanced Study in 2013 and has joint appointments with the Departments of Electronic and Computer Engineering, Chemistry and Physics. Prof Tang was elected to the fellowship of the American Physical Society in 1998, and membership of the US National Academy of Engineering in 2006. He is also a founding member of The Academy of Sciences of Hong Kong. He has received honorary degrees from the University of Hong Kong, Shanghai University, and South China University of Technology. 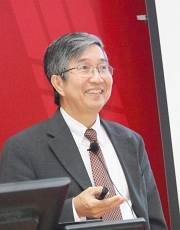 In addition to the Wolf Prize in Chemistry, Prof Tang has received many other awards including the Eastman Kodak Innovation Award (2000), the Jack Rajchman Prize of the Society of Information Display (2001), the Carothers Award of the American Chemical Society (2001), the Rochester Law Association Inventor of the Year Award (2002), the Humboldt Research Award (2005), the Daniel E. Noble Award (2007), the Eduard Rhein Award (2013), the Nick Holonyak Jr. Award (2014), the IEEE Nishizawa Medal (2017) and the NEC C&C Prize (2018). He has also been inducted in the 2018 US National Inventors Hall of Fame. Li, K., Cheung,Y., Tang, C., Zhao, C., Lau, K. and Choi, H. (2016). Optical crosstalk analysis of micro-pixelated GaN-based light-emitting diodes on sapphire and Si substrates. Physica Status Solidi (a), 213(5), pp.1193-1198.